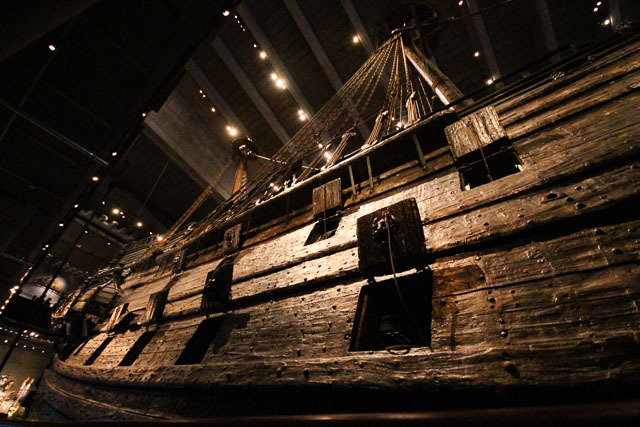 From 1626 through 1627, hundreds of labourers worked day and night to build one of Sweden's most impressive warships which would carry 64 canons and 300 soldiers into battle. 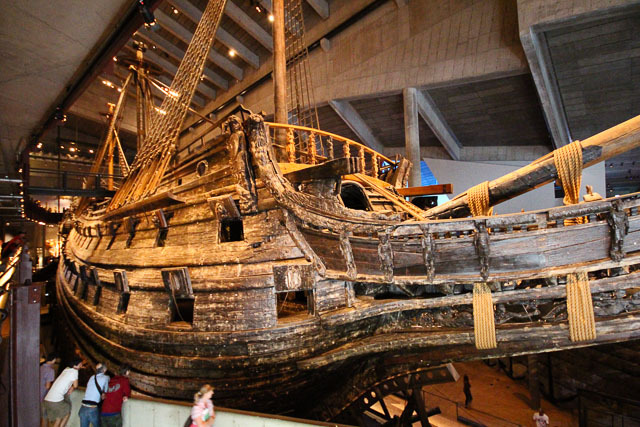 By August 10, 1628, the Vasa ship was ready for her maiden voyage and locals gathered along the shore to watch the 150 crewmen and their guests sail away from Stockholm. She departed but as they left the sheltered port, the wind caught the sails and the ship began to heel. The crewmen tried to steady her but she heeled again, even further, and water began rushing in her open gun ports. Vasa sank, only 1300 metres from where she departed. It's estimated that 30 of the 150 on board died. Vasa sat in her grave not far from Stockholm's coast for over 300 years before Anders Franzén, an accomplished shipwreck researcher, decided to investigate. After finding the location of the wreck, he garnered support and assistance and finally, in 1959, the first lift took place. 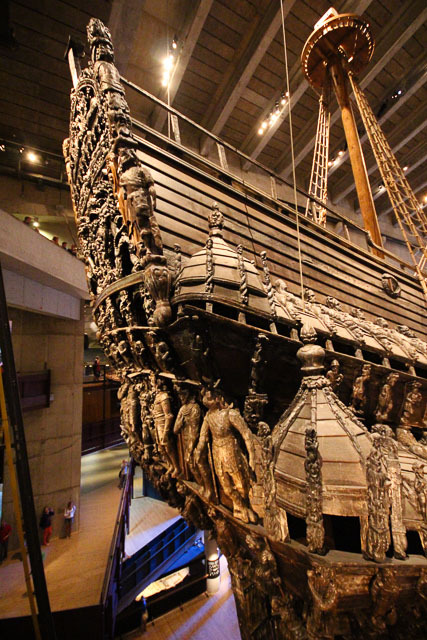 This was no easy feat - Vasa lay 32 meters below sea level and her soggy wooden body would be delicate. In 18 stages, she was lifted and on April 24, 1961, she returned to the surface. The work didn't stop there. Vasa was obviously very fragile and they worried that as she dried, the wood would warp, move and shrink causing the ship to fall apart. For 17 years, she was sprayed constantly with polyethylene glycol to prevent this from happening. Despite being in remarkable condition for her age, some reconstruction also had to happen but today, she is 95% original which is absolutely astounding. 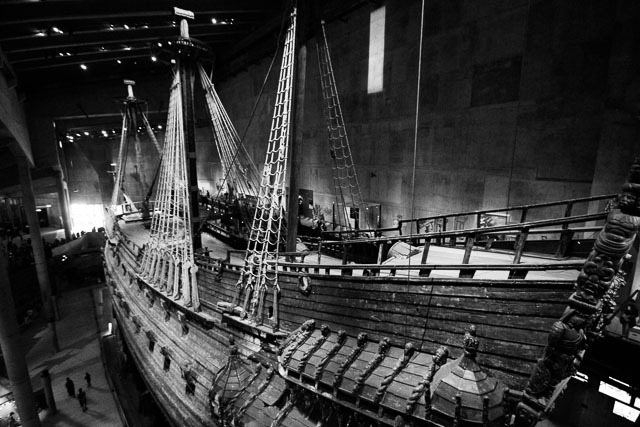 The Vasa Museum opened in 1990 but research still continues to this day in hopes of preserving her for as long as possible. 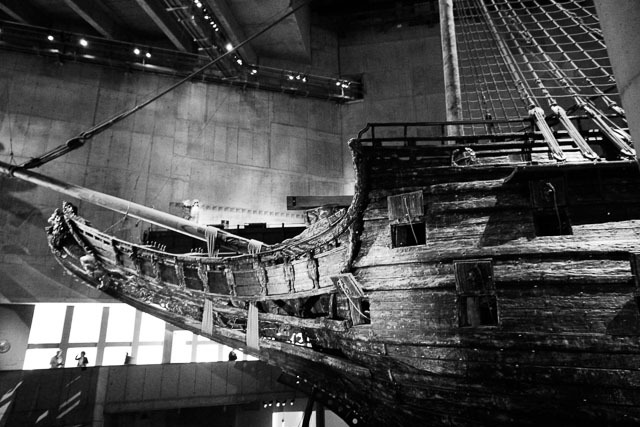 Before traveling to Stockholm, I'd heard that the Vasa Museum was a must-see but I'll admit, I hardly knew anything about the ship or it's history. We planned our visit for first thing Saturday morning and I expected to spend an hour looking at an old ship and then moving on, obviously, not expecting such a interesting story or exhibit. This was probably one of the coolest museums we have visited. The ship in itself is awe-inspiring and the story and exhibits are fantastic. They did a really wonderful job of compiling all sorts of information regarding the construction of the ship, those who sailed with her and the entire restoration process. They found 16 bodies when they recovered Vasa and their remains lay in glass boxes alongside their restructured faces and personal stories. Details as to the elaborate process of keeping Vasa in good condition and close up looks at her various intricacies are found throughout the large museum. Joe and I ended up spending 2.5 hours reading, learning and staring at Vasa. It was quite literally, fascinating and certainly ended up being one of our Stockholm highlights. +We arrived sometime after 9 am and while the museum was quite busy inside, we didn't have to wait in line for tickets. When we departed, the line snaked outside the building for quite a ways. Definitely visit early! +I'd recommend watching the film in the theatre first. It's played in different languages but there are always English subtitles and the movie is short. +There is free WiFi in the museum and there are audio guides available for download (also free) to listen to as you tour the exhibits. I downloaded them onto my iPhone and we listened to a few as we perused. Details are found above the museum pamphlets outside the theatre. +All information regarding opening times can be found on the museum website. There's also quite a bit of information regarding Vasa and a couple of videos for those of you who can't visit the museum but are interested to learn more! I saw a BBC feature about this and fell in love with the idea of visiting. I did some work in uni about restoration and recovery of art historical objects from bogs and wetlands in the UK, and understand the triumph that is Vasa's preservation. Incredible. Lovely photos! That research you did sounds fascinating Jess! I know - I'm pretty sure Jess took the coolest classes ever at university! This is fascinating! I'v never heard of this until now, but can't wait to add it to my "must see" list. It is just as I remember it! I went as a young girl and I still talk about our awesome trip to Norway and how much I loved this museum. Cannot wait to take my boys there! This is fascinating! These maritime disasters are kind of haunting, but so interesting - must have been such an experience! What an amazing but sad story. 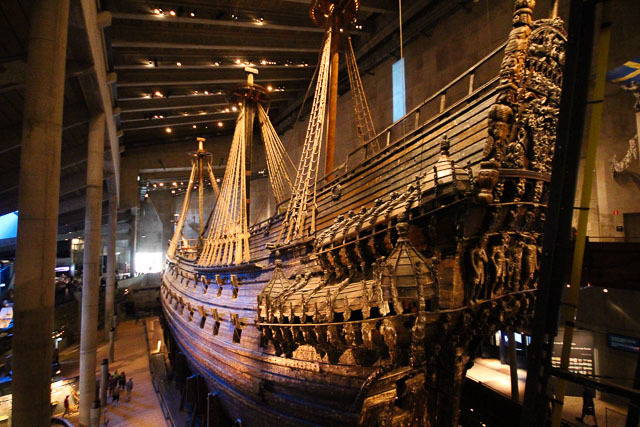 I'd certainly love to visit the Vasa museum, it does sound really interesting! I finally figured out the 'virtual copy' thing in Lightroom & thus, black & whites ensued. What a beautiful piece of craftsmanship! I would LOVE to go to this museum some day! AGAIN!! YOUR PHOTOS!!! You seriously are so talented and you make me want to learn how to take my camera off manual!! What enchanting photos. Wow! I particularly like the black and white shots. The Vasa does look quite good in B & W! I hope you get to see her in person sometime soon! Wow wow wow! I'm a history nerd, I would have peed my pants at this. How incredible that they managed to salvage a wooden shipwreck like that and keep it so well preserved for so long. Now this is an amazing piece of history! 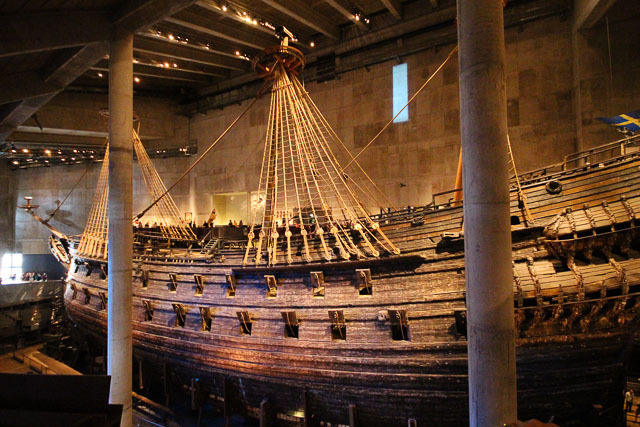 My husband is desperate for us to visit Stockholm (his grandfather was from there) and when we do, I'm going to make sure we go to the Vasa Museum. Wow, this is one heck of an old ship! It's interesting that they opened up an entire museum for this one single ship - it just goes to show its historical significance!